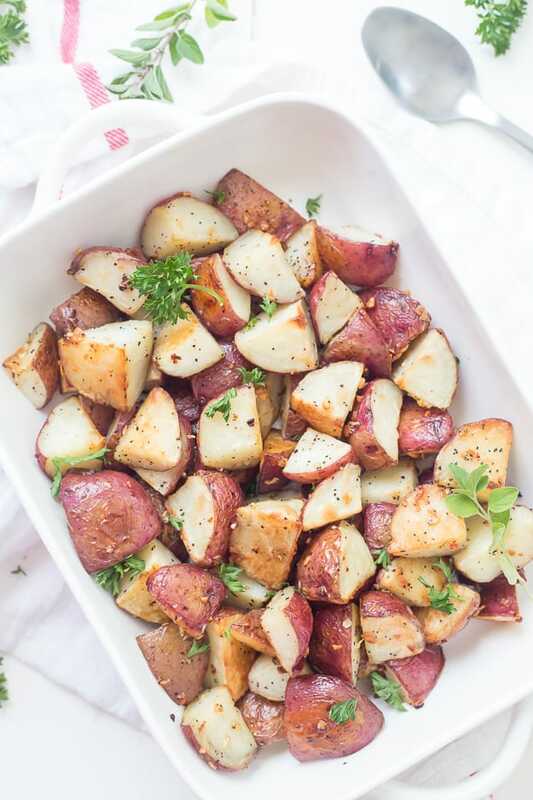 These easy Garlic Roasted Red Potatoes are full of flavor! They are crispy on the outside and oh, so tender on the inside – my favorite. Oven-roasted potatoes are a must-have for any meal! PIN IT TO YOUR SIDE DISH BOARD ON PINTEREST TO SAVE IT FOR LATER! I can’t believe I am saying this, but this is my first Thanksgiving post this year. With that being said, I can’t believe it’s only a few weeks away! Like everyone always told you as you were growing up, take advantage of your younger years because the years start to breeze by. That it’s the exact saying, but it’s something like that. And it’s true! It seems like I just graduated high school, got married, and now I am getting closer and closer to being 30 (3 more years, but close!). I’m not sure how that relates to garlic roasted red potatoes or even Thanksgiving, but I just had to get it off my chest. Now that we have opened up about how quick the years are going by let’s chat about these garlic roasted red potatoes. So you must be thinking, why didn’t you include the parmesan cheese?! And I am going to respond back with, “Well dear, these aren’t GARLIC PARMESAN roasted red potatoes, just garlic.” Let’s allow the garlic to shine because they do make these red potatoes shine. Whenever I make garlic parmesan potatoes, I usually cut down on the garlic, but these have to include all of the garlic hence the name. I may have had a little too much coffee this morning, but that’s okay, too. Make sure you have a roasting pan or baking sheet large enough! If you LOVE potatoes, I recommend trying our Garlic Parmesan Pan Roasted Potatoes, Smashed Herb Lemon Baked Potatoes, or Crispy Garlic Smashed Potatoes. The key to making this fantastic garlic roasted red potatoes is by using fresh garlic, not garlic powder. I am a fan of garlic powder, but just not when the garlic is the star of the dish. Another tip I highly recommend is to use a roasting pan or baking sheet large enough so that diced potatoes aren’t too close together. The more room each diced potatoes has will make your roasted potatoes roast evenly and brown evenly. Make sense, right? Looking for fantastic mashed potatoes, try our Southwestern Mashed Potatoes (nice twist! ), Crock-Pot Ranch Mashed Potatoes, or our Slow Cooker Loaded Mashed Potatoes, as you can see potatoes are my weakness! 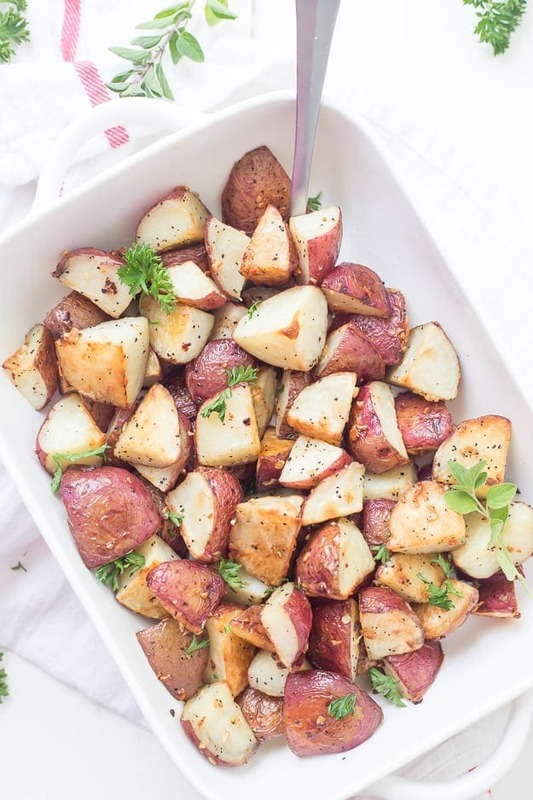 These easy Garlic Roasted Red Potatoes are full of flavor! They are crispy on the outside and oh, so tender on the inside - my favorite. 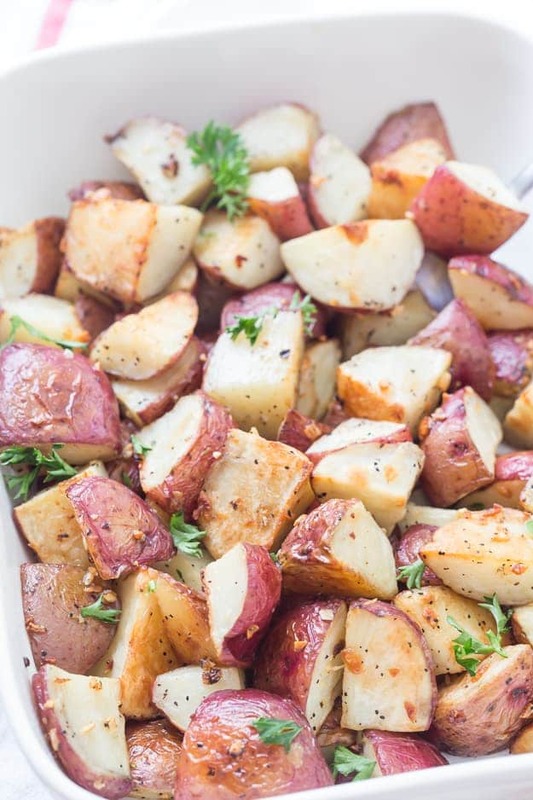 Oven-roasted potatoes are a must-have for any meal! Preheat oven to 375 degrees. Spray non-stick cooking spray on a roasting pan or a large baking sheet. Set aside. Place the potatoes, oil, garlic, salt, and pepper into a medium mixing bowl and toss to combine. Add the potatoes to the roasting pan or baking sheet and bake for 40-50 minutes, flipping the potatoes over halfway, or until the potatoes are tender.